Sketch entitled "Ascent of Santanoni." 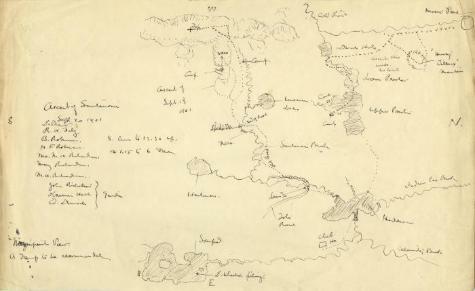 Sketch includes a group of seven hikers and three guides hiking Santanoni Peak, in the Adirondack Mountains. Names of hikers, a map and the comment, "Magnificent view. A trip to be recommended," is also in view. Source: Adirondack Museum Library, Tahawus Club records, MS 61-134. Rights: This record is not part of the New York State Archives' collection and is presented on our project partner's behalf for educational use only. Please contact the home repository for information on copyright and reproductions.